Is summer your favorite time of the year? It is for 30% of millennials, who believe it’s the perfect time for outdoor activities, like swimming, and sports. And, psychology agrees with this assumption. One article says a love of summer “might mean that you love getting out and living an active lifestyle. The warm months of summer are a time to travel and enjoy the outdoors.” And, summer 2018 was poised to be ripe for the latter. A study revealed, “after two slower years,” 68% of Americans and 64% of Europeans planned to take a summer vacation. People were out and about. And, savvy event marketers recognized the great opportunity the season offered to get in front of this younger generation, who wields $200 billion in buying power – now, the most of any age group, having surpassed Baby Boomers this year. They know millennials want an experience, and most will look it for outdoors. 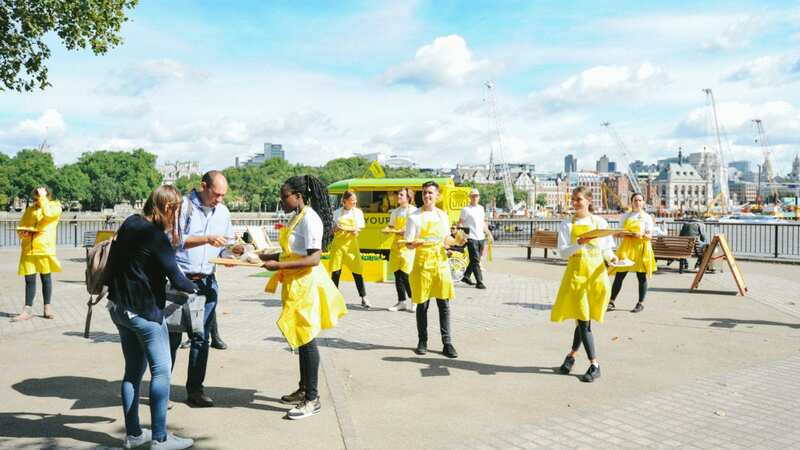 It’s these reasons we saw some of the very best brand activation events this summer. Brands brought the heat to reach consumers in new ways and out-of-the-box places. Here are seven stand-out brand activation events. But, more important, here’s why they won consumers this summer. They made the biggest splash at the summer’s biggest events, like the US Open and UK music festivals. Mercedes-Benz was front and center wherever the eye could see at US Open tennis championship, its logo emblazoned on both ends of the net. But, where the brand shined most was off the court. It first drew attention to its continued sponsorship with a pre-event contest to win tickets to the Open. It hid branded tennis balls near its G-Class models, parked in different NYC locations. Participants followed tennis champion Sloane Stephens who gave clues on Instagram to find the vehicles for access to Mercedes-Benz suite at the US Open. The suite – a lounge with outdoor seating and food and drinks – provided VIP treatment for contest winners, customers, and dealers. And, others got to know Mercedes-Benz and its offerings through two on-site showrooms, which offered a virtual reality game and unique tennis-inspired photo ops. It was an ace serve, though not the first for the automaker known for top-notch brand activation events. Danish alcohol brand, Carlsberg, is a familiar face at UK music festivals. And, it’s one that’s welcomed by attendees for the value it adds to their experience. Building on the success of its “Danish Quarter” that premiered at Reading’s 2017 event, Carlsberg brought the activation back this summer. Its initial draw might have been the free WiFi and phone charging stations. But, people stayed for the intimate acoustic sets from rising musicians, as well as the cold beer. Before leaving, they made videos seated on a bike in a gif booth big enough for their whole crew. Then, they came back for the DJ set, which let them dance into the wee hours. For UK’s Latitude Festival, Carlsberg modified its Danish Quarter programming to be more family oriented. It added bread-making and bracelet-weaving workshops, enticing people to not only visit, but to stay a while. They popped up in unexpected places, from the airport to the zoo and beyond. L’Oréal Group brand, Yves Saint Laurent Beauté, wanted to reach Chinese travelers this summer. So, it chose a hot spot for target consumers – Los Angeles International Airport – as the site for its unique pop-up experience. The activation showcased the brand’s offerings using Chinese influencers, makeovers, and product sampling. Perhaps the most unique aspect was its “Make It Yours” station, which let travelers customize lipsticks with stickers and engraving. And, the experience wouldn’t be complete without a lipstick wall perfect for selfies. Street teams or other experiential marketing tactics aren’t new to other transportation hubs, such as subways. But, New Zealand winery, Brancott Estate, went big this summer with unique brand activation events at several London tube stations. There, passersby were surprised to encounter a pop-up vineyard, made up of 75 feet of living vines. Among them, they got to sample Brancott Estate wines, take photos, speak with wine experts, and even buy bottles. It all made for excitement on what could’ve been an ordinary day, imprinting the brand in commuters’ minds. Another unique product sampling program showed up in a smart place this summer to reach targeted consumers – kids! Tree Top brought its apple sauce, in its new see-through packaging, to five U.S. zoos through its “Squeeze the Day” campaign. Kids loved the refreshing treat, as well as the time and photos with the Tree Top mascot. And, parents enjoyed learning about the brand and its products, as well as the giveaways and the increased value of their family outing. They hit the road to connect with community. Following launch of its QLED TV at Los Angeles’ E3 Expo, Samsung hit the road to let people experience it for themselves. Its experiential tour gave gaming enthusiasts the chance to compete on the Xbox One game, Forza Motorsport 7, using the new TV. The contests were held in several U.S. cities via custom-built gaming pods aboard the brand’s high-tech semi-truck. Winners received prizes from Samsung and Xbox. But, the real prize for all was the interpersonal interaction and community building. Coffee also serves as the cornerstone of many communities. And, it’s a beverage many take seriously. So, cold brew brand, STöK, sought to give U.S. consumers the education they desire by tapping brand ambassadors and fellow coffee lovers to explain the differences between cold brew and iced coffee. Better yet, they let them take a load off and enjoy samples among friends, before playing STöK branded games and taking fun photos. It was a great way to stop people out looking for an experience, while helping them stay cool in more ways than one. The Elevate team was fortunate to provide representation for many of the summer’s best brand activation events. Let us help you bring the heat year-round.